SUSPECT PHOTO - The Inquistr. 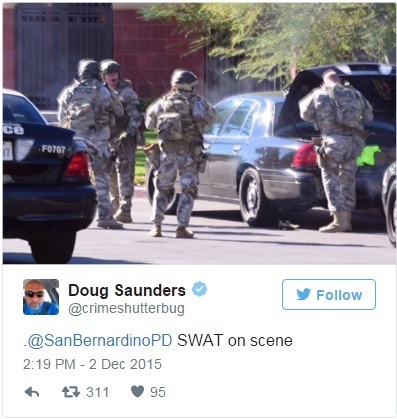 [UPDATE] Via Washington Times " San Bernardino Police Chief Jarrod Burguan said the attackers “came prepared” to commit maximum mayhem with long guns, camouflage and a plan to enter and leave quickly. Terrorism analysts said the attack bore hallmarks of a sophisticated terrorist operation. [UPDATE] According to the 1st video above, LIVE FEED, at 6:30pm ET, they are checking a vehicle for "bodies," believed to be two of the suspects, another one or two still at large. [UPDATE] No suspects are in custody yet as per LA Times. [MAJOR UPDATE] Conflicting reports on the suspects with Pamela Geller quoting a The San Diego Tribune article which stated "Riverside police dispatchers have broadcast a general advisory that the suspects involved in the shootings in San Bernardino may have fled in a black GMC Yukon, heading northbound on Waterman Avenue, roughly 40 minutes ago. The broadcast indicated there were unconfirmed reports the suspects were male and of Middle Eastern origin, "armed with AK-47s and wearing body armor." Editors NOTE - The Tribune article no longer reflects that... why did they change the information? The conflicting report comes from The Daily Mail which states authorities are searching for "three 'white men dressed in ski masks and armed with AK-47s'"
[UPDATE] A couple interesting points made by InfoWars, specifically "Shooting comes hours after Republicans block debate on gun bill." Also, as seen in multiple comments below, InfoWars reports "There are unconfirmed reports the shooting was carried out by at least one Middle Eastern male, a rumor that feeds into the domestic terror and ISIS narrative." 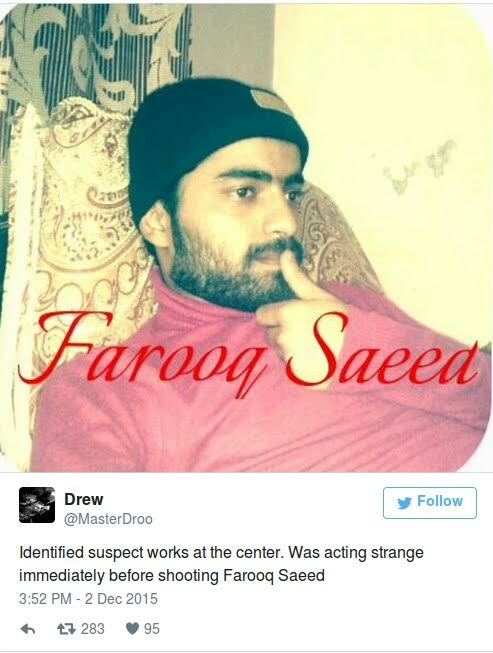 They also provide a couple of Tweets claiming "Arab suspect named on police scanner." 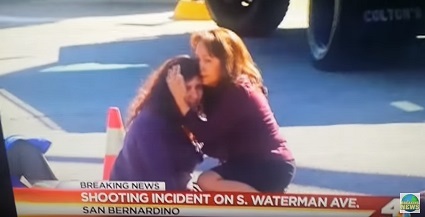 Breaking news of a mass shooting happening in San Bernardino, California, with preliminary reports claiming at least 20 people shot, with some reporting that nearly 12 people have been killed. Fox 11 in Los Angeles reported that police are looking for up to three men, dressed in military gear, perhaps wearing body armor. They apparently fled in a dark SUV. 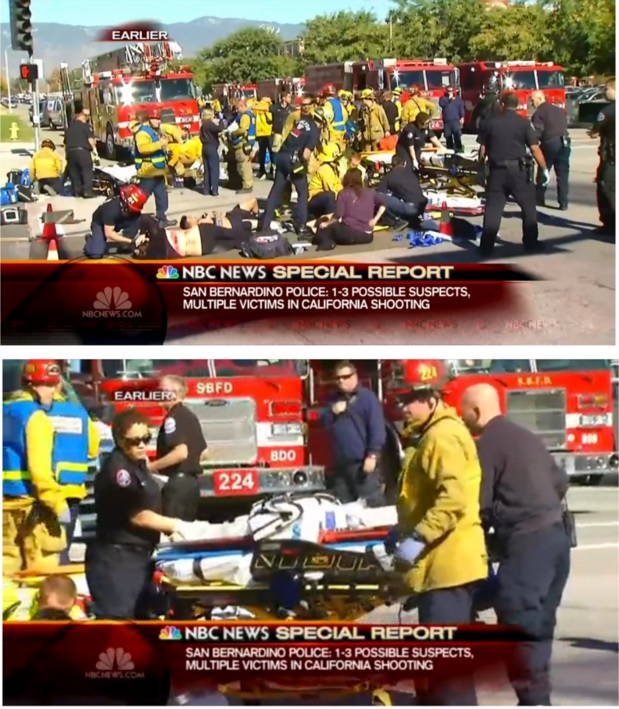 There are reports of up to 20 casualties, but no word on their condition, KTLA is reporting. 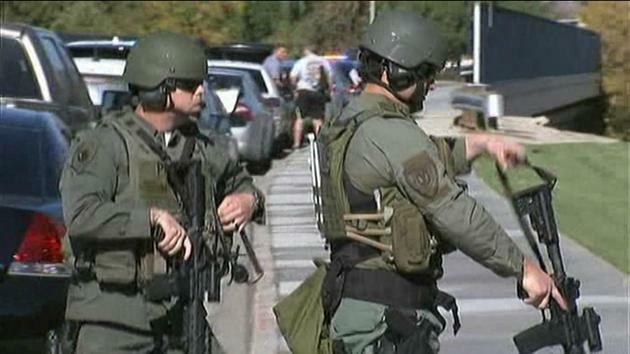 The shooting happened inside the Inland Regional Center. The building is not secure and police are going door-to-door, police spokesperson Sgt. Vicki Cervantes said. According to the San Bernardino Sun, the Inland Regional Center provides services for developmentally disabled people. There are reports that there are nearly a dozen fatalities. 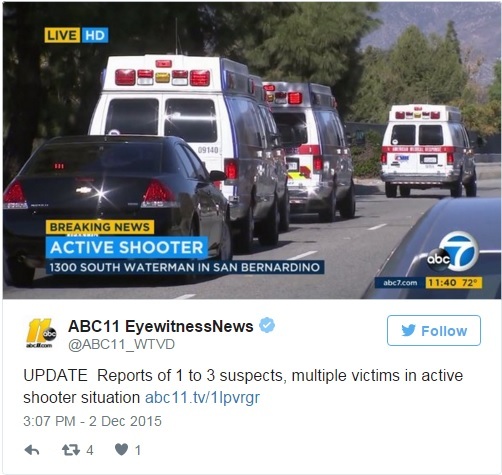 [Update] ABC News 7 is also reporting "Police said there may be multiple victims in an active-shooting situation in San Bernardino Wednesday. Sources tell Eyewitness News that up to 12 people were killed." • A woman who works at a building where the shootings occurred texted her father, Terry Pettit: "Shooting at my work. People shot." Pettit told CNN affiliate KABC his daughter, who was locked in her office, told him 10 to 20 people were shot. • CNN affiliate KABC reported that the shooting took place at Inland Regional Center, a facility for people with developmental disabilities. Inland Regional Center's Facebook page says it employs nearly 670 staff at its facilities in San Bernardino and Riverside counties, providing services to more than 30,200 people. H/T Thor from the All News PipeLine BREAKING NEWS ALERTS page.